(Nanowerk News) Tiny whirling magnetic patterns called skyrmions are attracting attention as potential data carriers in next-generation memory devices. RIKEN researchers have now discovered that a magnetic field can be used to switch a group of skyrmions between two different lattice arrangements, demonstrating the kind of control needed to develop such devices (Science Advances, "Skyrmion lattice structural transition in MnSi"). The atoms in certain materials carry their own intrinsic magnetism, with each acting like a bar magnet. When these miniature magnets are swept into tiny swirling patterns, they collectively form skyrmions, which behave as discrete particles. Being circular, skyrmions typically pack together in a triangular lattice (Fig.). Taro Nakajima and Hiroshi Oike of the RIKEN Center for Emergent Matter Science and colleagues studied how this skyrmion lattice can be manipulated in manganese silicide. 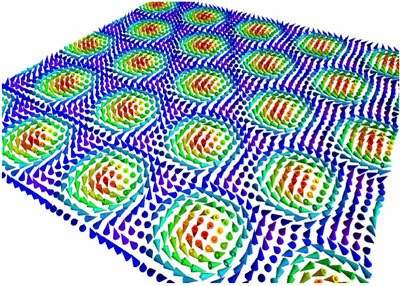 Generally, skyrmion lattices only appear in this material within a narrow range of temperatures and magnetic fields. That makes the lattices too fragile to rearrange. Working with researchers at the Australian Nuclear Science and Technology Organisation (ANSTO), the team formed a more robust skyrmion lattice by applying electrical pulses to the material at 12.5 kelvin and a magnetic field of 0.2 tesla. The pulses rapidly heated the material, causing skyrmions to form in a window of stability between 27 and 29 kelvin. The sample quickly cooled, locking the skyrmions into a triangular lattice that were stable over a wide range of temperatures and magnetic fields. The researchers then cooled the sample to 1.5 kelvin and used neutron-scattering experiments to study how the skyrmion lattice changed under different magnetic fields. At magnetic fields below 0.1 tesla, the lattice rearranged into a square pattern that was stable only within a relatively confined range of very low temperatures and magnetic fields. Raising the field to 0.2 tesla resurrected the triangular lattice. The researchers suggest that these lattice transitions are influenced by unevenness, or anisotropy, in the underlying magnetism of the manganese atoms in the material. At low magnetic fields and temperatures, this anisotropy allows the skyrmions to partially overlap, moving closer together to adopt a square lattice arrangement. Similar effects are well observed in particles like atoms.